When you start to look for a new watch, one thing is certain—there are an incredibly large number of brands from which to choose. 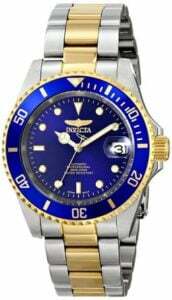 Not only is it slightly overwhelming, for those that have very little knowledge of watch brands, it can be very difficult to distinguish the well-made products from the shoddily-made products. Luckily, this watch brands list is here to help, outlining the top watch brands for men in both the luxury market and lower-end market. They have been the official timekeeper of three Summer Olympics since the 1920s, have developed a watch for the McLaren F1 team, and they have been endorsed by a multitude of notable personalities, including (but not limited to) Brad Pitt, Tiger Woods, Leonardo DiCaprio, Maria Sharapova, and Uma Thurman. This elegantly handsome watch is called the Link. It is anti-reflective, water resistant to 100m, has luminous markers, is made of polished steel, and uses anti-scratch sapphire crystal, which makes this watch incredibly resilient. (Sapphire is extraordinarily hard—only a diamond can scratch it) Additionally, it is absolutely gorgeous with an understated sophisticated design that will catch the eye. This is the TAG Heuer Formula I. 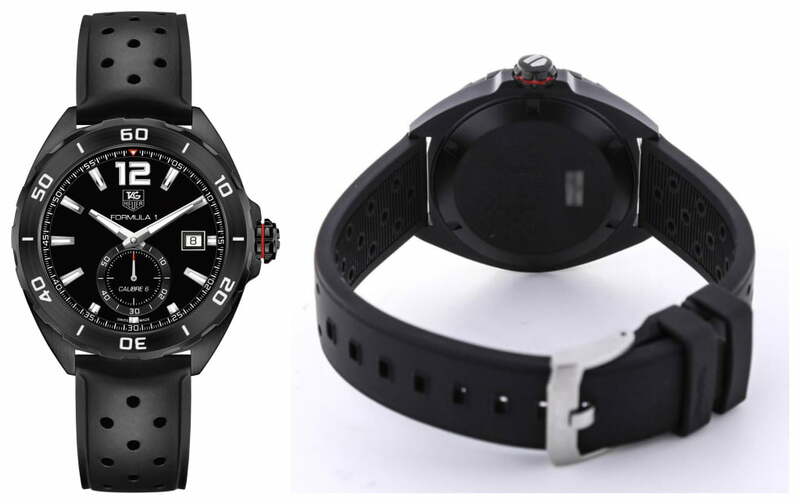 It is made of black titanium carbide, except for the strap, which is made of black perforated rubber. Like the Link, it uses anti-scratch sapphire crystal and has luminous markers for easy nighttime reading. Breitling was founded in 1884 in the Swiss Jura by Leon Breitling. 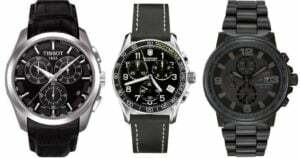 They are most known for making watches suited for diving and aviators and their designs typically incorporate large watch faces for easy reading. This is the Navitimer Cosmonaute. It was originally developed at the request of astronaut Scott Carpenter in 1961. Carpenter and his fellow astronauts in the Mercury space program needed a watch with a 24-hour dial because there is no differentiation between night and day in space. 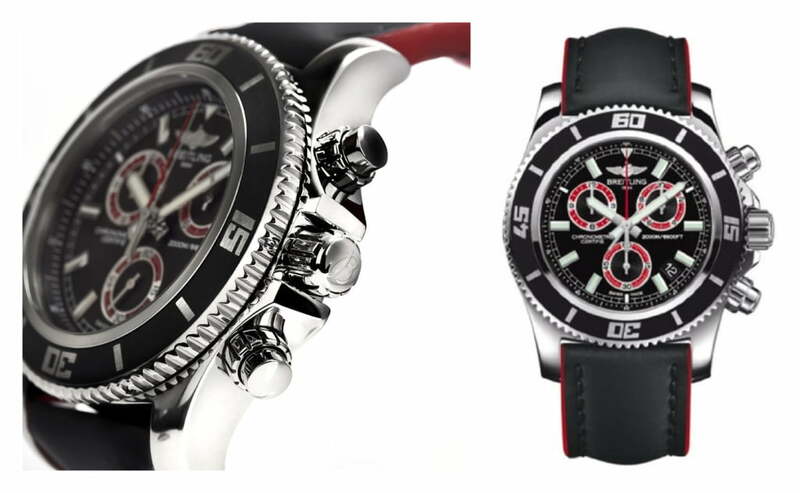 This particular version is made of black steel with an ocean racer strap, but other styles are available. This is the Superocean Chronograph II. 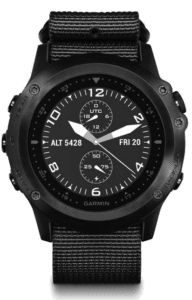 It is water-resistant to 2000 meters and is made of stainless steel and anti-reflective, scratch-resistant sapphire crystal. The hands and markers are luminous for easy underwater or nighttime reading and it uses battery-operated quartz movement. Additionally, it comes with a free lifetime battery replacement and a three year warranty, making this a sporty and attractive timepiece that will not only impress, but function under pressure. Founded in 1830 by two brothers, Louis-Victor and Celestin Baume, Baume & Mercier was originally called “Freres Baume.” Today they specialize in affordable luxury watches, creating gorgeous timepieces that don’t cost as much as your first house. They have been endorsed by individuals such as Gwyneth Paltro, Andy Garcia, Ashton Kutcher, Evangeline Lily, and Kiefer Sutherland. Featuring a classic and timeless design, the Clifton (the product above is style no. 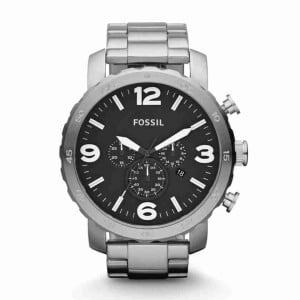 10054) is a fantastic casual watch for the man looking to add a little class to his everyday look. It is water-resistant to 50m, made of stainless steel and anti-glare, anti-scratch domed sapphire crystal, and features a genuine alligator strap. It comes in a wide variety of styles, which can all be seen here. 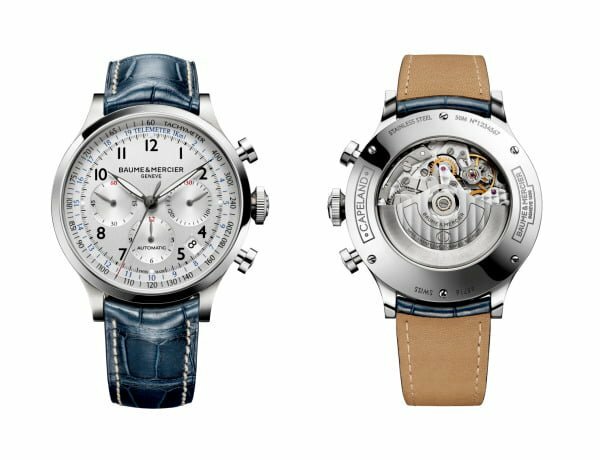 This is the Capeland (the model featured here is no. 10063), described by the company as a “sport-chic” line of watches. 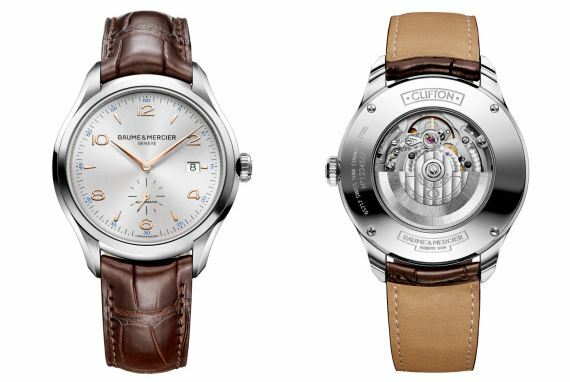 It features Swiss-made mechanical movement and an authentic alligator strap, as well as anti-glare sapphire crystal. All of the different styles in the collection can be viewed here. Okay, Zenith’s inclusion here is borderline breaking the rules because the majority of their watches cost over a fortune. However, they do make some less expensive watches that won’t break your budget. 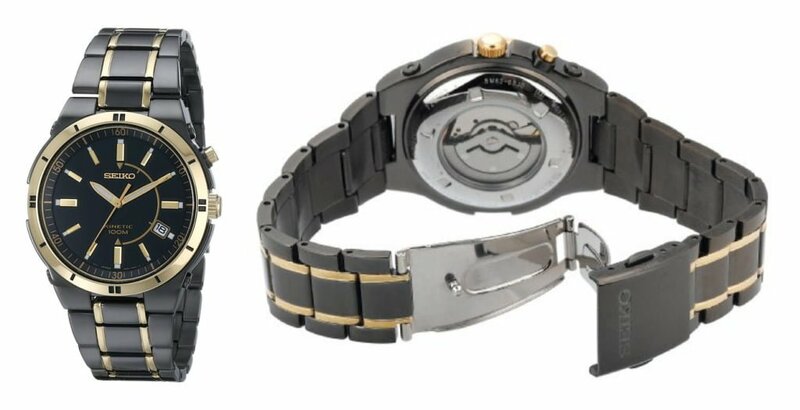 This is the Central Second, which is part of Zenith’s Captain Collection. This is a simpler watch with few frills, but it has a classic and elegant look that gives it timeless appeal. 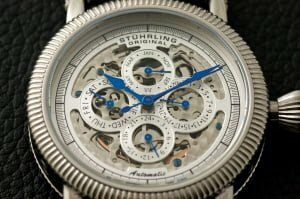 It is a watch that would be well-suited for someone who only needs the basic functions of a watch but wants a recognizable and reputable brand. This is the PILOT Type 20 Extra Special, It has an oily nubuck leather strap, luminous numerals, steel body, and double treated anti-reflection domed sapphire crystal. The white-on-black and large numerals give this timepiece a bold look perfect for everyday casualwear. Oris is a newer brand, with a history that only dates back to 1904. Oris watches are a great choice for someone who cannot afford (or who does not want to spend) several thousand dollars on a watch. 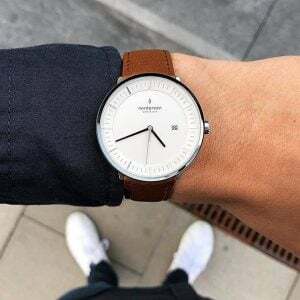 While they make some higher-priced timepieces, they also offer more inexpensive watches than any other brand on this list. Make no mistake—just because the brands featured in this list are not considered luxury does not mean that they create junky products. You can find a perfectly great watch easily and many of them look just as nice as the higher-end brand’s pieces featured above. 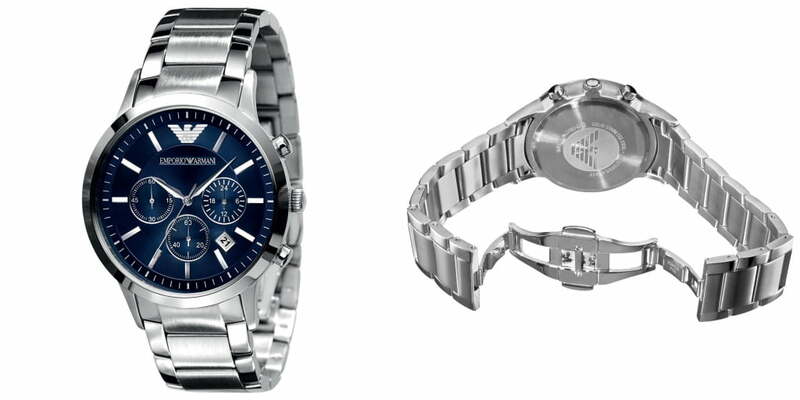 Casio is an industry staple that makes watches to fit almost any occasion or need. 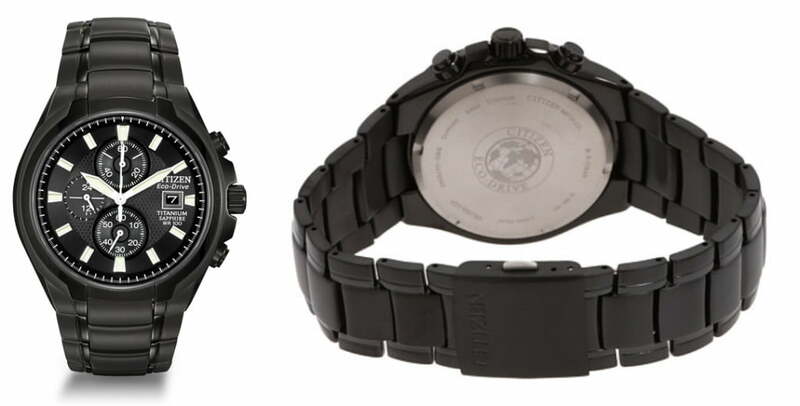 While they are often associated with chunky, clunky rubbery watches, they also make extremely elegant and attractive watches that are tactical, tough, multifunctional and higher-end in appearance. This is a G-SHOCK G-Aviation watch. It is solar-powered with a rechargeable battery and water-resistant to 660ft, and features luminous hands, atomic timekeeping, alarm capabilities (including the most important alarm component: the snooze button), mineral crystal dial window, and the times in 29 different cities around the world. Casio is less well-known for its dress watches, but, as seen by the included picture, they do make a good-looking and highly functional dress watch. It is water-resistant to 330ft, has a mineral crystal display, and is made of stainless steel. The luminous hands make it easy to read at night or in dark places and the black face gives it a bold and distinguished appearance, making it a great choice for formal or semi-formal situations. Armani watches are surprisingly affordable, yet still have that ultra-stylish and slick appearance that one would expect from the Armani brand. 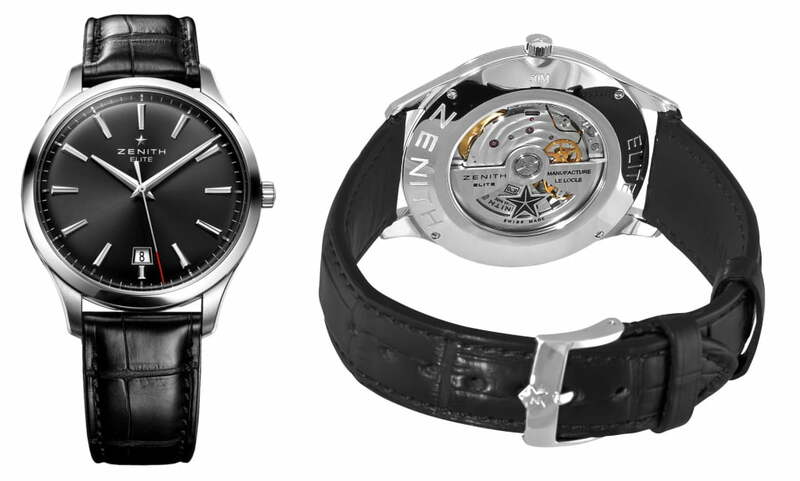 They offer casual, formal, and sport watches, although there are not very many of the latter. Armani watches are the perfect watches for someone who wants the designer name and quality without the incredibly hefty price tag so often seen on designer products. This is the Classic Blue Dial Chronograph Watch, It is water-resistant to 165ft, shock-resistant, and scratch-resistant. It is elegantly and classically designed and has a timeless appeal that will survive the ages. The bright blue watch face contrasts nicely with the gleaming stainless steel; altogether, this watch presents a sporty, yet classy appearance suitable for both casual and semi-formal situations. This is Armani’s Ceramic Black Skeleton Dial Watch, Both the case and the bracelet are made of ceramic rather than stainless steel, as is the norm. 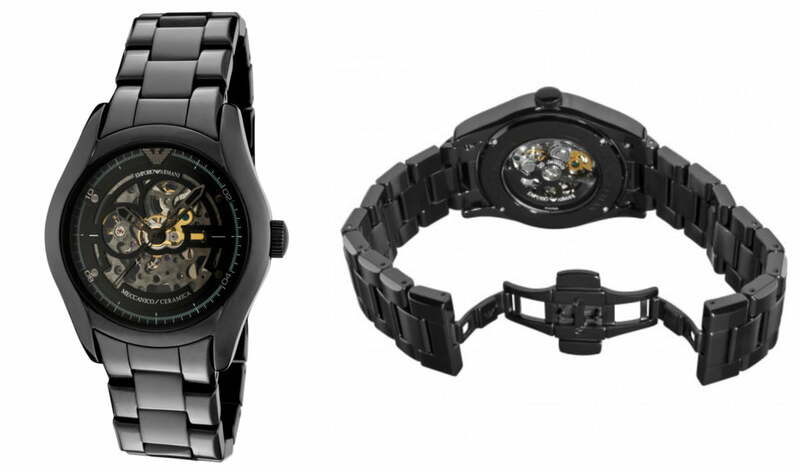 The all-black case and bracelet make a bold and powerful statement and the skeletonized dial adds an element of visual interest, as well as allowing the wearer to witness the intricate movements of their timepiece. 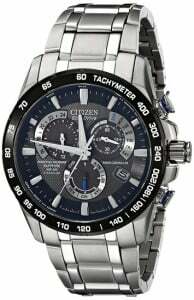 Citizen makes some of the most gorgeous and popular watches in its price range. Many of their products feature Eco-Drive, which is powered by light and charges the watch in both natural and indoor light, which is incredibly useful. This is one of Citizen’s titanium watches featuring Eco-Drive, The titanium, rather than stainless steel, construction gives it a lightness rarely seen in men’s watches and incredible durability. The dial window is made of sapphire crystal, further enhancing this timepiece’s hardiness. This is Citizen’s “Primo” watch, It is constructed out of stainless steel and also features Eco-Drive, removing the need for a battery. It is water-resistant to 330ft and has a tachymeter, 60-minute chronograph, and mineral crystal dial window. 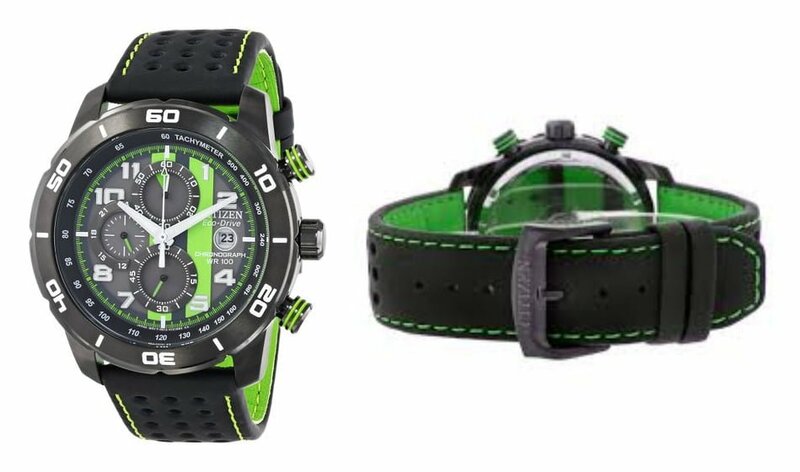 The band is made of leather and features neon green detailing, as does the watch face, which gives the piece a real punch. 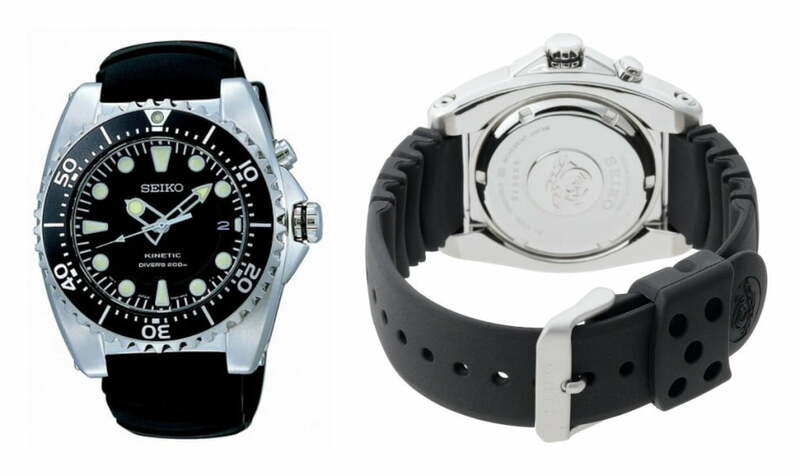 Seiko is another industry standard that has a reputation for affordability and quality. 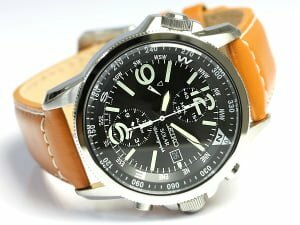 They are one of the most popular brands and offer a variety of styles (such as this solar powered seiko) from which to choose so that anyone can find a watch that perfectly suits them. This is Seiko’s Stainless Steel Two-Tone Kinetic Dress Watch, It requires no battery as it is powered by the kinetic energy generated by arm movement. The watch face is protected by Hardlex crystal and water-resistant to 330ft, making it exceptionally durable for such a low-priced dress watch. The design is classic, though the two-tone detailing ensures that it does not look too traditional. This Seiko “Adventure” Stainless Steel Kinetic Diver Watch is an absolute gem. Like the dress watch profiled above, it also uses kinetic energy to power itself, rather than relying on batteries. It was made for use while scuba diving, as it is water-resistant to 660 feet. Despite its rugged construction, this timepiece still manages to look classy and attractive, something that many brands have yet to master. If you want a reasonably-priced sport watch that will easily keep up with any activity in which you partake, you definitely need to have a look at Luminox prodcuts because they are some of the most ruggedly well-built timepieces available and is actually used by the US Navy SEALs and US Air Force pilots. This is Luminox’s Nighthawk watch, It is water-resistant to 660ft, made of stainless steel, features luminous markings that light up automatically, uses Swiss quartz movement, and to top it all off, it is protected by anti-reflective and scratch-resistant sapphire crystal. Not only is it durable and heavy, its appearance is extremely awesome and sporty—perfect for the adventurer that lies inside you. 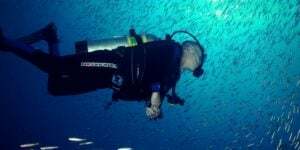 If you’re a diver whose main concern when selecting a watch is visibility, stop the search now because you’ve found it. This is Luminox’s Original Navy SEAL Dive Watch, It is as easy to see in the dark as it is to see in the sunlight. It is water-resistant to 660 feet and is protected by a mineral crystal dial window and polyurethane casing. Plus, as with almost all of Luminox’s products, it looks like something a sportier James Bond would wear, which is always a plus. 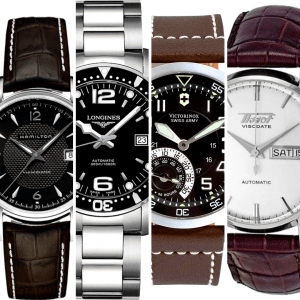 Hope this article has helped you in choosing the best watch from the brand that fits your style!